First make sure that the circuit path (trace) is really broken – I just may look like, but isn’t. To do this you need a volt-meter. Follow the suspected trace in both directions until you find a pin or through-hole it is connected to. Use these two points to test if the trace is still connected. Use the knife to scratch-off some of the coating lacquer on both ends where the trace was “cut” until you see some copper shining through. Check with your volt-meter that you actually have contact with one end and e.g. a pin on the other end of the trace. Do this for both “halves” of the cut trace. 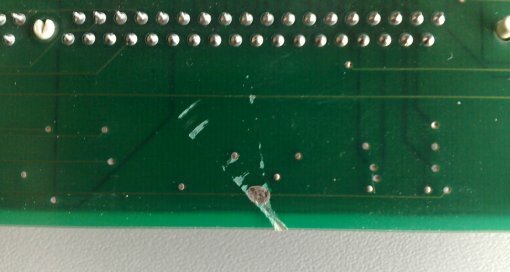 Mask the place you’re going to ‘heal’ with your adhesive tape – this prevents the conductive lacquer to run all over your board. Using your volt-meter, check again. This time from both ends of the complete trace. If you’ve done everything right, the trace should work again – and so does your card/board! Yay! Here’s how my badly scatched MiroHIGHRISC looks like in certain places – can you spot the little silver dot? 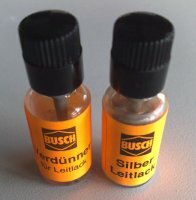 Final hit: Some lacquers are quite thin on silver (blame the manufacturer) so after some days the spot you just fixed might become unreliable. In this case you might repeat the procedure to get more silver to that spot.